Australian film editor Huw Parkinson has produced a mash-up video, “Game of Thrones: Winter is Trumping”, blending Donald Trump’s quotes into scenes from the HBO series Game of Thrones. Produced for ABC (Australian Broadcasting Corporation) politics show Insiders, the Game of Thrones Winter is Trumping film shows Donald Trump, with his Valerian steel sword Deal Maker, integrated into a range of Game of Thrones characters. He begins as Parthian lord Xaro Xhoan Daxos refusing to give refuge to Daenerys Targaryen. 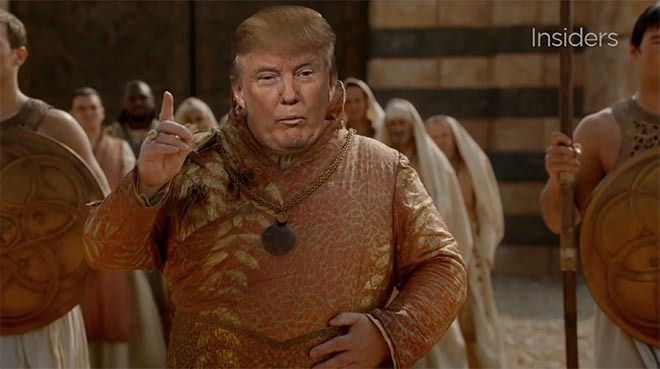 Trump lectures the council, confounds Tyrion Lannister, and presents his plans for a big wall by playing Jon Snow and defying Jon Snow.